Bus number 169 arrived. The digital screen on top of the bus, in block orange letters, indicated that it was headed towards the University of Queensland. I got into the bus both nervous and excited. In the next couple of minutes, my dream was going to turn into a reality. As a child, I had one simple dream. I dreamed of studying in one of the best universities in the world. Because I come from a middle class family in Nepal however, that dream seemed farfetched. In fact, from my Tahachal home in picturesque Kathmandu, it felt almost unattainable. Despite the odds, I never gave up on a dream that I worked long and hard to conquer. Fortunately for me, I also had the unwavering support of my family. They always encouraged me to aim for the stars. The bus halted at the UQ Lakes station. I hopped off and made my way towards the lake. While walking alongside the lake, I saw little turtles snorkeling and heard white cockatoos chirping. I felt welcomed. As I kept walking, my eyes caught a glimpse of the famous Forgan Smith building. I had only seen and read about it on the screen of my computer. Now, I was in front of it. Nothing could have prepared me for that moment. I was spellbound by the grandeur and beauty of its sandstone architecture. Entering the Forgan Smith building, I felt like I was in a Harry Potter movie. The Forgan Smith building felt like the Hogwarts School of Magic. Wingardium Leviosa! Engulfed by large buildings, I was overwhelmed and lost. I had never studied in a big university like the University of Queensland. I had no idea where to go. I also could not figure out where to get help. I did not enter the buildings because, at the time, I did not know if the buildings were accessible to everyone. Hence, I kept walking without knowing where the path would take me. “Excuse me…” I politely approached a stranger. “Oh! Hi there!” she replied. I followed her and on the way, she introduced herself to me as Hannah. She was studying marine biology at UQ. Hannah was kind enough to show me around the campus. We passed the Duhig library where students were busy studying. She also introduced me to the Food Court where I later treated myself to Butter Chicken. It was delicious! Finally, we arrived at the Student Services building. She handed me over to the receptionist who further helped me. Hannah hastily wished me luck and hopped towards the exit door of the building. I figured Hannah was heading towards her lecture when I had asked her for help. She could have easily denied. However, she did not. Instead, she went out of her way to help out a stranger. This random act of kindness deeply touched me. “Thank you so much for helping me out!” I blurted. For me, the University of Queensland is not only a big university but a university full of people who have even bigger hearts. I feel privileged and proud to be associated with the University of Queensland. Since joining UQ, Arahat has become involved with the activities of various UQ clubs and societies to get the complete uni experience. 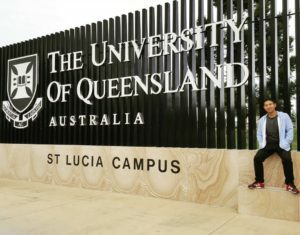 Arahat Sundar Tuladhar is an MA student currently living his dream of studying Communication for Social Change at UQ’s St Lucia campus. This entry was posted in Campus sprawl, First Day and tagged 2010s, Overseas students. Bookmark the permalink.